Clinics, Therapy Centers, Chiro - contact us for bulk pricing! I love the relief it gives me... i don't know any other way to engage the antagonist muscles to help relieve the tension caused by all the gripping/flexing we all do daily. after testing them, i've made it a part of my routine to maintain by "tool" (hands for work) as well as offering/suggesting them to my clients... every client has given great feedback! FlexEx is a simple, easy to use finger, hand and forearm exerciser for Computer Users, Sportsmen, Musicians, Tennis/Golfers, Climbers, Exercise Enthusiasts and any one who wishes to strengthen their hands, forearms and fingers, improve your sport or rehabilitate weakened hands and fingers. Use FlexEx to achieve increased hand, forearm and finger strength in an easy, simple, non-cumbersome way. 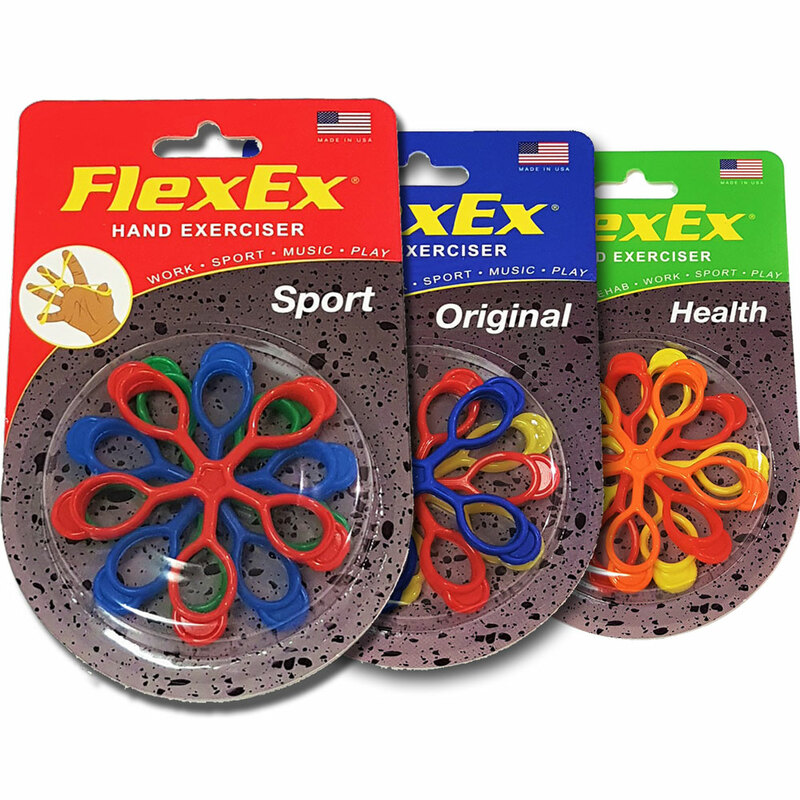 FlexEx is the most lightweight hand, forearm and finger exerciser on the market today. So simple and non-cumbersome, the FlexEx can be used any place and any time. Just throw it in your pocket or purse and use at your convenience. FlexEx comes in 3 different editions (Original, Sport, Health) each containing 3 Different resistances, all provided to you at the time of purchase. The design of the FlexEx is ergonomic, sleek and lightweight. FlexEx achieves and surpasses the effectiveness of other bulky and sometime impractical finger and hand exercisers on the market today in a simple non-cumbersome easy to use way. Strengthening and exercising the wrist and fingers should include both stretching of the flexors which are often overused and tight, and strengthening their less used counterparts. FlexEx achieves this in an easy, and simple way. FlexEx’s simple unique design means that it can be used Anywhere and Anytime – just throw it in your pocket or purse and use at your convenience – traveling in the car, on a train, in the airplane, on a boat (not while operating a vehicle), sitting at home in front of the TV or computer, on a work break or whenever or wherever else you choose. Innovative design keeps product from sliding down your finger, unlike other products on the market. The FlexEx effectively exercises and strengthens the hands, fingers and forearms and can even rehabilitate an injured wrist (Carpal Tunnel, etc.) without any bulky, bothersome contraption. FlexEx is Proudly Manufactured and Packaged in the U.S.A!